Juice On the Rocks :Best Summer Drink to be enjoyed in hot weather. Will instantly chill you out. What is so refreshing then holding a glass of chilled drink and sipping it in hot and sweaty days? Though alcoholic drinks are popular, preparing pure and healthy chillers or mocktails is fun and I bet everybody would love it. I have posted many summer chillers on my website and juice on the rocks was not something I had in my mind, but since my son doesn’t like to eat any fruits, I experiment in my kitchen and thought, why not make fruit juice cubes and serve it in lime juice. And trust me, he really liked it. Very easy and quick to prepare. 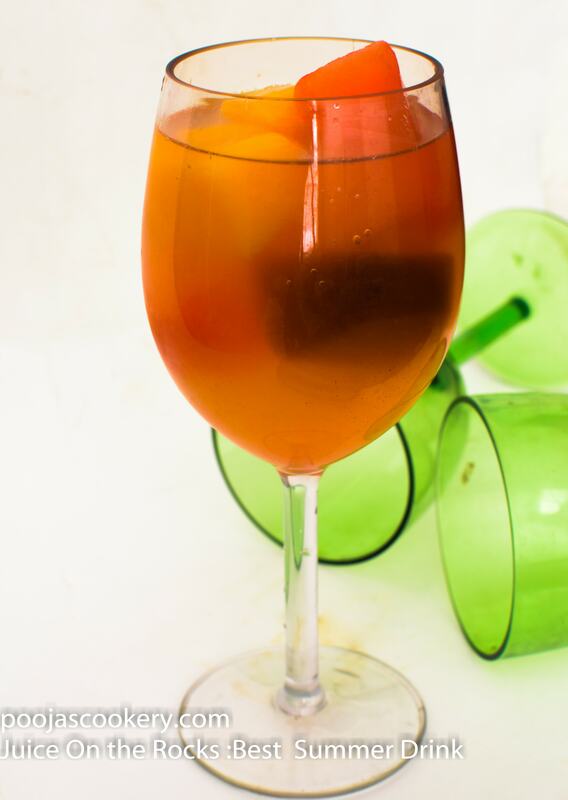 You can also serve this drink for kids party , as it is totally non alcoholic punch. Use any kinds of fruits to make juicy cubes . Prepare them in advance if you are planning for a party and I am sure your guests would appreciate this colorful drink. So guys! Let’s beat the heat with juice on the rocks. In a small bowl, take 1/2 cup water and mix rose syrup . In other bowl, take black tea and add a teaspoon of sugar. Mix well and keep aside. In the ice tray, pour in rose syrup mixed water in 4-5 sections. Pour prepared tea and orange juice in the remaining sections and freeze fo r 4-6 hours or over night till you get nice flavored ice cubes. Prepare the lime juice in other bowl by mixing 2 cups water with remaining sugar, pinch of salt and lime juice. Remove the ice tray out and drop in the each flavor of ice cubes in the glass. Pour the prepared lime juice and beat the heat. Pour prepared tea and orange juice in the remaining sections and freeze for 4-6 hours or over night till you get nice flavored ice cubes. It is so pretty in the glass, and I love how the flavor of the ice cubes will accent the juice for a fun boost of flavor! Very fun!